Set in the heart of historic downtown Lenox, Bistro Zinc is a modern French bistro designed by Jason & Frank Macioge that boasts fine cuisine and a refined but welcoming atmosphere. The sleek bar area contains a zinc bar and an world class gallery of photographs. Its friendly staff and delicious meals have helped Zinc to become a favorite among locals and tourists alike. Reservations available for Dinner only. Call today! Opened in 1999 by Jason Macioge, Bistro Zinc is a proud member of Jason Macioge’s Palmetto Restaurant Group, which also includes one of Lenox’s most beloved casual restaurants: Betty’s Pizza Shack. Since its inception, Bistro Zinc has time and time again proven itself as both a culinary staple of Berkshire County, and the absolute pinnacle of local hospitality. Set in the heart of historic downtown Lenox, Bistro Zinc is a modern French bistro designed by Jason & Frank Macioge that boasts fine cuisine and a refined but welcoming atmosphere. The sleek bar area contains a zinc bar and a world-class gallery of photographs & art with selected works by Walton Ford, Michael Moebius, David Yarrow, Slim Aarons & Paul Nicklen. Its hospitable staff and unparalleled cuisine has made Zinc a favorite amongst locals and tourists alike. Jason “J” Macioge, CEO/Owner of Palmetto Restaurant Group, believes that exceptional foods and fine wines, along with an elegant and styled atmosphere, are the keys to any successful establishment. Jason has seamlessly created several restaurants, including Bistro Zinc and Betty’s Pizza, capturing the essence of those details. With a keen understanding of the invaluable nature and benefits of collaboration, Jason has assembled an extraordinary and talented staff that shares his philosophy and vision; thus, enabling him to concentrate on his many varied interests. Jason currently lives in the Berkshires, and is kept company by his two extremely energetic basset hounds, Beaumont & Bunny – who can be found at the restaurant every morning. Bistro Zinc is the perfect spot for your special event or celebration. 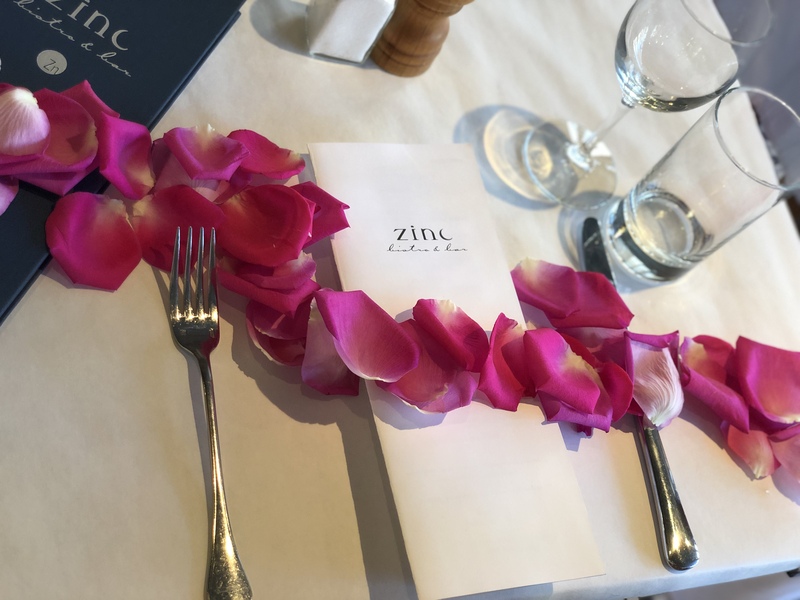 Would you like to book your event at Bistro Zinc? Bistro Zinc offers a very special and unique space for a number of different venues. From birthday parties to rehearsal dinners, we are able to cater to all of your private party needs. We have seating that can accommodate up to eighty-five people, with a wide variety of menu options, including: a la carte, hors d’ oeuvres, price fixed and tastings. With a full bar and wine cellar, there is not a better place in the area to have your event. To schedule your event or for general inquiries, please call us at (413) 637-8800 or send an e-mail to bistrozinc@gmail.com. © 2019 Bistro Zinc. All rights reserved. Site design by Studio Two.